The Foo Fighters did a funny as hell short video -- directed by Dave Grohl -- to promote their performance on DirecTV the Saturday before Super Bowl LIII. 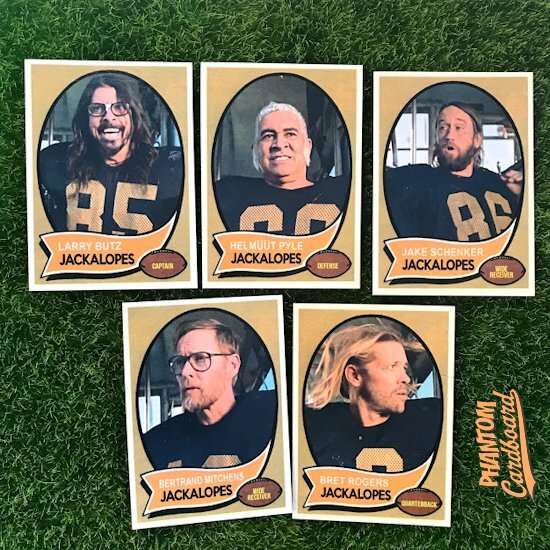 In the video they play a fictional 70's era misfit football team called the Jackalopes. I had not seen this video prior to a person, who is familiar with my cards, recommended I make football cards based upon it. Not only that but he recommended the perfect design, a 1970 Topps football inspired template. This person thought I'd love the idea and he was exactly right. I'm sure had I seen it before this the mini-set would have already been in the works. For a long time the Foo Fighters were my favorite band (now they share the top spot with Halestorm). Here's the real kicker, the requester was attending a Super Bowl party in Atlanta on the Friday before the Super Bowl and the Foo would also be there. So the goal was to get these babies autographed. I also made a set for each of the band members to have. The word was that Pat Smear loved them. Nate Mendel thought they were cool and Dave, who in my opinion is the bar none coolest guy in rock, got a good laugh out of them. All signed except Chris Shiflett who I guess just doesn't sign. And, I'm told I should have signed copies of the Dave and Pat's card in the mail soon. I might just sleep by my mailbox until they get here. This gentleman is seeing the band again towards the end of the month and will try to get the additional signatures.